Learn how to set up the Watson WordPress theme. This is an 18 minute video walkthrough of setting up your site to look like Watson’s demo site. Click the thumbnail below to play. Go to the Edit Post screen for your post. Posts that are included in the featured slider will not appear in the default blog post listing. Since the posts in the featured slider are included at the top of this listing, they does not appear a second time in that same listing. Featured slider posts will, however, display in archives and RSS feeds. The featured thumbnails are displayed after the second post in your post list, on your home page. Posts in the featured thumbnails area will appear in the default blog listing. These posts will be displayed twice if included in the featured thumbnails area. Changes to your theme options can be previewed in real time. Your can preview changes by clicking “Customize” on the Appearance → Themes page of your admin panel. Set a logo and high-resolution logo (for Retina/Hi-res devices). Hide tags, categories, authors, dates, featured images and post navigation. Choose a primary color (used for links and other accents). Set up Watson’s social icons. Add credit/copyright text to the footer. Watson adds a set of buttons to WordPress’s visual editor, which make it easy to use Watson’s pre-defined styles in your posts. To view these extra buttons, make sure you’ve enabled the “Kitchen Sink” option on the visual editor. Examples of these elements can be viewed on Watson’s demo site. To add items to your sidebar or two footer areas, navigate to the Appearance → Widgets screen on your admin dashboard. Watson’s sidebar cannot be disabled. If empty, the sidebar will display a message explaining how to add sidebar widgets. 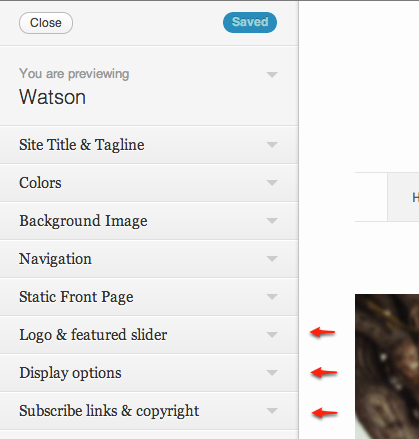 The Watson Theme Recently Discussed widget is featured in the sidebar of the demo site. The widget was designed to be placed in the sidebar, and probably shouldn’t be placed in either footer simply because it won’t look as nice. The widget displays the featured image, title, and date of last comment for your 3 most recently commented posts. 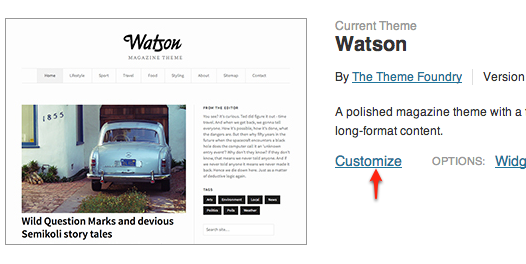 The Watson Theme Recently Discussed widget will not be carried over if you switch themes. To provide Retina-friendly versions of your images for high-resolution devices, we recommend the WP Retina 2x plugin, which is used on Watson’s demo site.